I've meant to do this race for awhile (heard great things), but this year they added a 21.1k so I figured it was the year. 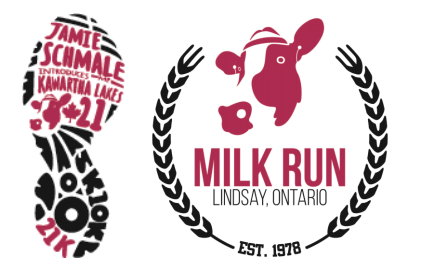 The regular milk run is a 5k/10k up in Lindsay around town. This race is point-to-point, starting at Daytonia Beach (not to be confused with Daytona) and mostly following the Victoria Rail Trail. Lots of gravel but very flat... should be interesting. There is actually a bus that takes participants from the finish to the start, leaving 45 minutes before the race starts... this wasn't alllll that well communicated, and neither was the race kit pickup (leading to some confusion on whether there was race day pick-up or not). It's their first year offering the distance so I'm anticipating some "growing pains"! Hopefully not too bad, but I'll bet a carton of milk a bunch of folks miss the bus to the start. Point to point races are always a little challenging for organizers, hope they're up to the challenge! I biked 200km Friday, so I'm in ridiculously bad shape for this race. It was always going to be "just for fun" so i'm not that worried, I'll just go out and do what I can. I did a 21.1k long run on Monday (again, bad preparation!) not knowing I'd be doing this race at 5:23/km... I think 5:15/km is probably a reasonable goal pace. I'll try it out and back off if it's not going well.